I am on Ravelry as gothicfeline. 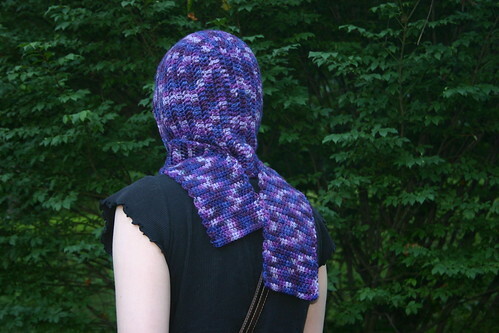 I wanted to make a hooded scarf that did not require any seaming and was actually shaped like a head. This was the result. To make fsc: ch 2. Insert hook into first chain, yo, draw up a loop. You should have two loops on your hook. Yo, draw through one loop. Yo, draw through both loops on hook. One fsc made. Insert hook into BASE of previously made fsc, yo and draw up a loop. Yo and draw through one loop on hook. Yo and draw through both loops on hook. Second fsc made. Attach yarn with slip stitch to opposite corner of hood. Repeat rows 16-66.
cut yarn, tie off and weave in ends. I have been wanting something like this forever! Thanks :) I may try to usee your design as a base and incorporate some sort of (easy!) decorative stitch as I get bored with DCDCDCDC easy, LOL. This is great though, not many nice hooded scarfs out there and I really like em since it's less likey my dumbness will lose a hat/scarf in one peice, XD. My sister-in-law is going to love this :) she likes hats/scarves that don't come off ! The scarf is done along the side of the hood. If it were to be laid flat (or as flat as it can get), the scarf would stick out forward of the hood. You rock! I got it figured out and am loving it. I don't have a hat head - I look way better in hoods. 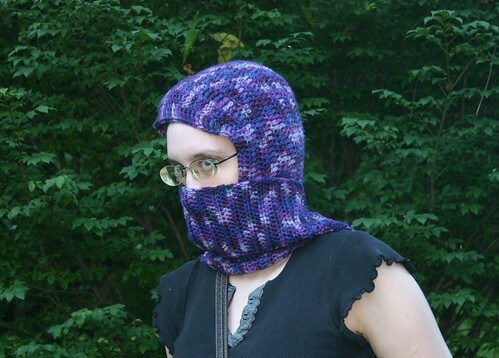 I added a picot trim around the sides and top of the hood which frames the face beautifully. I'm also thinking of making a version without the scarf-just folding up the neckline to form a nice band and adding a button. Tre Chic! Again, thanks for the way cool pattern. Andrea. Wow! This is perfect! I'd been trying to figure out how to fold a regular scarf and stitch it up the back without having a pointed headed head. But this makes sense to start in the back and add stitches as you go. There are a few ways you could make the hood bigger. You could do more rows of increasing, which would make it bigger in pretty much all dimensions. You could add extra rows of straight dc. Or you could start with a longer row of fsc. If you do anything that adds more stitches, just remember to keep the treble stitches at the middle/top of the hood. @Juanita - Sorry, I don't have a pattern for a shawl with attached hood. I hope you find one! Thanks for sharing, I love the seamless part. Is saving time the only reason to use a fsc instead of a chain then single crochet? If I wanted to do it the old way would it change the pattern any? Thank-you so much . I was looking for a pattern and never found one. how can i modify the hood to be more loose and open, more like a hoodie sweater, and less like a beanie? blacksheepe really is my e-mail address. You are my hero!!! I really don’t like the pointy elf-like hoods. Wish I had seen this when you first posted it. Thank you mega bunches!